In order to assess and analyze the current state of educational technology we must look at baseline metrics to establish a starting point. The following is an objective summary of instructional and technological innovation strategies in light of “industry standards” or within the educational realm, other similar school districts, and educational trends. 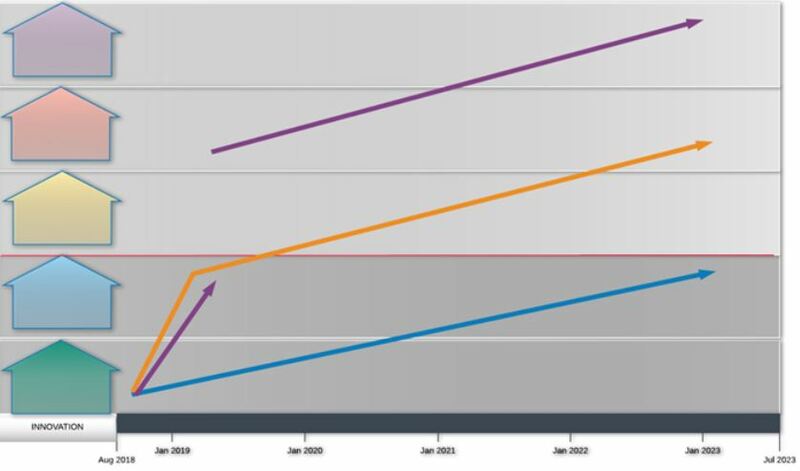 This exponential expansion when applied to schools and school districts manifests in infrastructure requirements and device counts growing in the thousands of percentiles – imagine the growth of moving from one computer per staff member to one computer per student, and the impact on wireless and wired network capacity. If organizations are not advancing at the pace of technological growth, they are, in essence, losing ground to the rest of the community. Worse yet, if obsolescence or disfunction of any sort become part of the infrastructure or organizational environment (Ed Tech and IT), the status quo is really not. Some of these characteristics can be observed in a school district’s inability to report data effectively – both internally (Chronic Absenteeism) and externally (State Reporting data), respond efficiently and effectively to projects and requests, and foster a cohesive strategic cooperation between instruction and IT operations. The leapfrog effect takes its name from the schoolyard game of Leapfrog where students form a line and the students stoop down while the rearmost student leaps over the others in sequence as the whole chain of students advances forward. This concept as applied to technology strategy endeavors not to just move forward by one step at a time in a gradual progression from status quo to phase 1, and phase 2, but to move from status quo to phase 2 by executing phase 1 and phase two at the same time. In effect, if the status quo is currently in a state of ineffective and inefficient, then addressing and remediating these inefficiencies can be one leap, while advancing to strategic innovations at the same time. The concept of disruption is well documented both for business as well as in education. The book by Clayton Christensen “Disrupting Class” has been widely read in education circles. Fundamentally, the concept is similar to the leapfrog effect but to a larger impact. Instead of incremental and sequential improvements and innovations, disruption breaks the progression and redefines a new starting point well beyond the classic incremental progression. By seeking to disrupt the typical path of improvement and innovation, the strategy seeks to move beyond the traditional metrics and milestones and set a broader set of goals, and a faster pace. 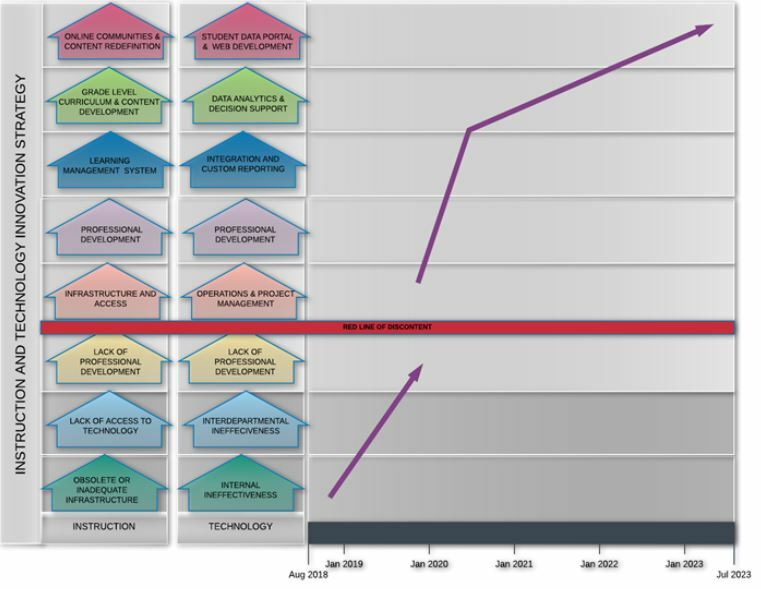 The Innovation Strategy chart details an example of an improvement strategy for both the Instructional Technology and Information Technology services departments. The progression (moving from bottom to top) shows factors of inefficiency and ineffectiveness that may be symptoms of disfunction or lack of structure or process below the RED LINE OF DISCONTENT, and progressively complex factors moving up from the red line. 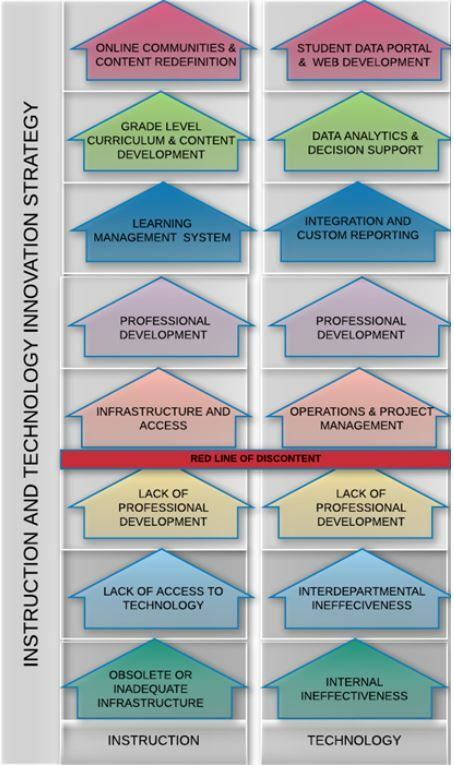 This is not to state that an organization is at or below the red line, only to demonstrate how an improvement and innovation strategy might deliver more complex and innovative instructional and operational support systems. The higher levels of this strategy focus on more leveraged and complex integration, customization and instructional trends. On the instruction side – use of LMS, content development and content redefinition (SAMR) are on the top. On the technical side – integration of data systems and report, analytics and decision support, and student access to performance and outreach services top the list. By disrupting the progression and seeking a new baseline above the red line, organizations can disrupt the slow moving progression suffered by many a school or business.